Hungry tennis fans had plenty to snack on at Wimbledon last week. Appx. 24,000 cans of Pringles, branded with the slogan "These are NOT tennis balls!" were provided to hungry Wimbledon fans outside the gates of the All England Tennis Club. Pringles has no official relationship with the AELTC and Wimbledon officials didn't seem to mind as they decided not to confiscate the cans from fans. 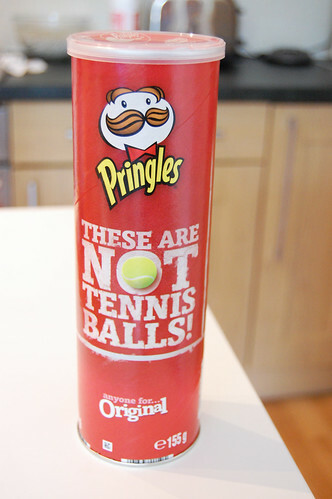 "Wimbledon does not have a deal with a comparable snack food, so there was no question of the Pringles tubes harming sales of a licensed product." We recently took a look at ambush and by way of vote you seemed to indicate a relative tolerance to ambush marketing tactics. So far, 76% of you say ambush is a fair and ethical marketing tactic. This is a pretty clever way of capitalizing on a "free" association that compares the inherent similarities between tennis ball cans and that of the P&G product. Going one step further, dopplegangers for Roger Federer and Bjorn Borg were brought in to draw the attention of fans. According to a Pringles Spokesman the campaign, which drew coverage in the Daily Mail and Telegraph among other news outlets, was "a fantastic, well-thought out and executed event in a relatively short space of time." The sampling campaign was handled by UK communications agency Touch and staffing firm Mash. So speak up in comments - is it still ambush if there's not a competitive brand officially involved in the event? Should properties protect their "assets" anyway as a way of "signaling" to future prospective partners?